On paper, The Snowman sounds like a fairly generic thriller about two cops in search of a serial killer who likes to leave behind snowmen. I know. It sounds kind of dumb but this project has a whole lot going for it. First off, it's based on a novel from Norwegian author Jo Nesbo who is also responsible for the rather brilliant Headhunters. The adaptation comes from Hossein Amini who also wrote Drive. The movie stars Michael Fassbender and Rebecca Ferguson as the two cops on the hunt for the killer along with J.K. Simmons, Charlotte Gainsbourg, Toby Jones, Chloe Sevigny and Val Kilmer. Need further convincing? It's directed by Tomas Alfredson, the man who brought us Tinker Taylor Soldier Spy and the brilliant Let the Right One In. Admittedly the trailer is kind of prototypical thriller: dead bodies, cops running around trying to catch a bad guy we don't see, lots of death but tucked in there are some really great visuals and a few snippets of interest. 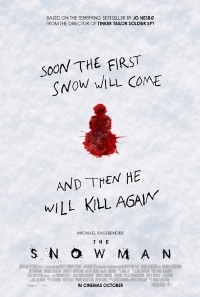 The Snowman opens October 20.